This post first appeared on The Spirit World January 2006. Thursday night a friend and I stopped by one of the new places in town. 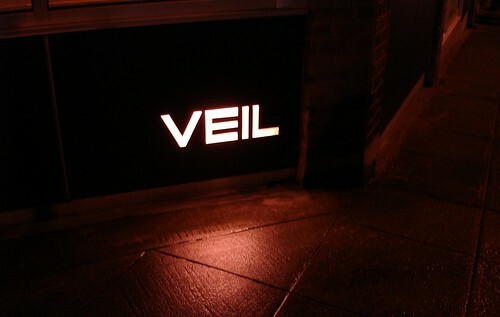 Veil is being discussed amongst all good foodies in the city and everyone who has not yet been there is planning to check it out soon. Located in the new little center of dining pleasure on the east side of lower Queen Anne, Veil adds a bit more momentum to the upscaling of this little neighborhood. Although I had read a couple reviews and had several people ask me if I’d yet been there I didn’t know that much about the place, except that the chef, Shannon Galusha, had trained with Thomas Keller. Upon entering you turn left to enter the lounge. The bar sits at the far end of the room but the focus of the room is the long table that runs from the entry point to the bar. It is surrounded by the little cube stools that seem to have become so popular – at least in Seattle lounges. On your right are two large cozy sections of banquette seating which could easily hold eight or more depending on how many little cubes you scrunched in. The left side of the room has similar bench seating but since that is the window wall, they don’t have the same cozy vibe. Everything is white. It’s white on white on white. If you’ve been to Bada Lounge in Belltown the feel is very similar. It also reminds me of The Blue Door in The Delano Hotel in South Beach. The lighting is light pink. I hadn’t realized how pink until I looked at my photos. Since I normally don’t use a flash the photos sometimes reveal more than you notice at the time. We started out at the main table but then one of the benches opened up and we moved into the protected space, sharing it with two other women who had also been at the table. There was plenty of room for all of us to spread out and still have private conversations. It was very nice. I ordered a Rosemary Bellini and my friend ordered a Margarita. We had a hit and a miss. My Bellini was really wonderful, although you will need to like rosemary to enjoy it. As you lift the champagne flute to your mouth, the fragrance of the rosemary hits your nose and reminds you of sunny places – something we desperately need in Seattle right now as we head into our 27th day in a row of rain. That’s a lot, even for us! The drink itself is just lightly enhanced with the rosemary flavor. It was really quite good. Although I did find myself munching on a rosemary leaf a couple of times! On the other hand my friend’s Margarita was not really up to snuff. It seemed to have been made with mix instead of fresh lime juice. Something a bit inconceivable, in this place that prides itself on only the freshest of ingredients! The food was very good and presented in the French Laundry style – big oversized plates surrounding small bites of exquisite flavors. We tried the Peanut Butter and Jelly Foie Gras (a bit gimmicky but the foie gras was perfectly prepared), a Lobster Macaroni and Cheese (absolute heaven! ), and White Asparagus with Crab Salad (another winner). Prices are not cheap, as you may expect, but not out of line; plates are small but extremely satisfying! I’ll definitely be back again. Maybe not on a weekly basis but certainly regularly. There were several items on the menu I would have liked to have tried and since the menu will be constantly updated I think this will be an ongoing quest.